Your opportunity to explore the campus, facilities, and bustling city of Plymouth where you could be living, studying and socialising. These sessions are based around the subject areas on offer at the University of Plymouth. Venues and times will be provided in the programme of the day. For queries on entry requirements and general admissions queries, please visit the Admissions stand in the Student Services Village (Rolle Plaza). 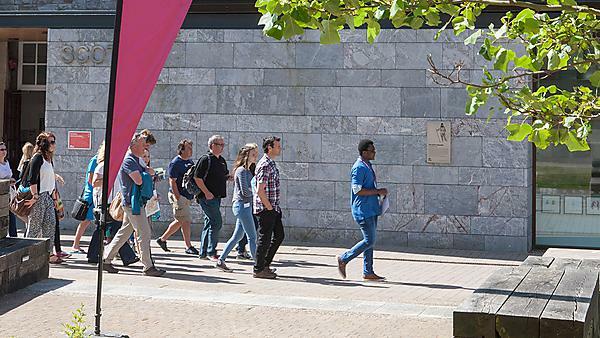 At the open day you will be walked through accommodation areas as part of your guided campus tour. Our on-campus show flat will also be open for viewing all day. International students are invited to visit the International Student’s Advisory Service drop-in session in the International Gateway, Roland Levinsky Building. The UPSU Sports Centre on campus provides a range of activities to assist students in achieving their fitness goals. From the 50 station Fitness Suite, squash courts, multi- purpose sports hall, dance studio and the sports injuries clinic, the Sport & Active Team can offer a host of facilities which can be utilised by students. On-site sports injuries clinic offering treatments and massages. The Students' Union offer a variety of attractive membership packages to students along with the ability to “pay n play” on all activities. Badminton, five-a-side football, netball, volleyball, basketball and table tennis are all available at the sports centre. Throughout the academic year, the Mount Batten Centre provides the operational base for the Students' Union water sports clubs and the University-led twice weekly recreational sailing and power boating sessions. The centre offers an abundance of activities, from half-day sessions to complete training courses and a full selection of RYA sailing, power boating and windsurfing courses are offered, from beginner to advance. Please book a space at the Recreation stand in Portland Square. Tour times will be confirmed on the day, so book as soon as you arrive. Why not take a 45-minute guided bus tour around the bustling city, complete with running commentary on what Plymouth has to offer? See the modern city centre and pedestrianised shopping area only one minute's walk from our campus, and pick out restaurants, bars and entertainment to suit every taste and pocket. Explore the historical yet vibrant Barbican, and also see how close the campus is to the Hoe, Plymouth's waterfront. There is no need to sign up, just turn up at the bus stop outside the City Museum and Library. For students interested in studying fine art, we recommend a 90-minute visit to Royal William Yard to see some of the facilities you will be using. Please book a space at the Faculty of Arts stand in the Roland Levinsky Building. For students interested in studying nursing, a tour of our state-of-the-art clinical skills labs will show you the facilities you will be using. For students interested in studying courses in physiotherapy, dietetics, podiatry, occupational therapy, operating department practice, optometry and paramedic practitioner, we recommend taking the shuttle bus to the Peninsula Allied Health Centre to see some of the facilities you will be using and attend a subject related talk. A shuttle bus service will be operating on the University side of North Hill.